of finding 'Whats your name'. I so enjoyed reading many of them and how your blog got it's name. I am keeping the fun open till the 10th so others can join too. announced on the 11th... exciting stuff. Oh I do at times... it's fun being silly. I so love this quilt, the yellows and the prettiness of the flowers. I used a charm pack that was a favorite of mine. pressies I sent her as part of the FRIENDS swap. I had a few people write me about the Iron caddy and Peg bag Pattern. and are at the low price of $4.00 US.. I love it all Dawn!!! 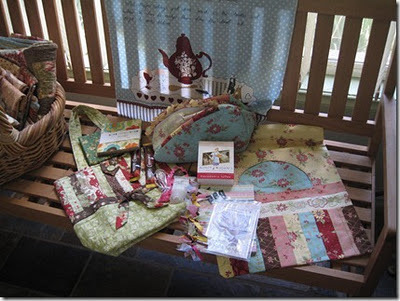 Will look out for my copy of Homespun...and may just find myself getting the iron cover and peg bag patterns .... They're gorgeous!!! 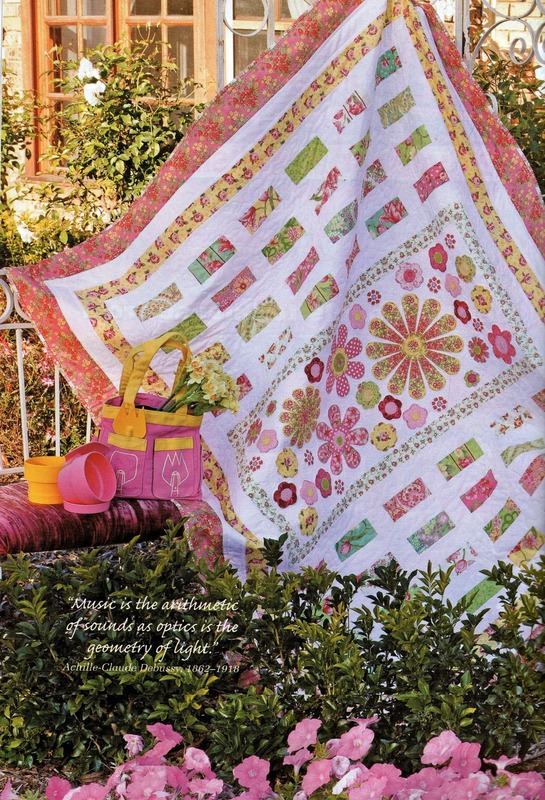 Love the Quilt Dawn and I always get Homespun sew am looking forward to receiving my copy. Yes saw Peg gorgeous gift you made and sent. Lucky girl. Goegeous quilt and what a lucky recipient to have you as a "Friend". Fun, fun, fun!! Your quilt brought a big smile to my face. Such a happy quilt , just love it and the gifts you sent to Peg are gorgeous , love the peg bag and iron caddy! Oh my goodness that quilt is just gorgeous Dawn, no wonder Homespun is my favorite publication - they have the BEST designers!! I'm looking forward to the pattern in your etsy! Beautiful quilt!! I never got a chance to post about my blog name...it's my name...or the first three letters from each name...my sons said I should brand myself...and so I call my bag business linsueray and my blog too! The quilt is absolutely lovely! Wish I was that clever! What a lovely quilt Dawn and i love the gifts that you sent Peg and i love what Peg sent you,what a great swap,and so much fun seeing what everyone is receiving. Oh MY. I am in LOVE with that quilt pattern!! The fabrics are yummy, too. Beautiful. Lucky Peg, to have you for a swap partner. :) So glad I found your blog. Love it. Fabulous, fabulous quilt. I might pretend that quilt is named after me. The quilt is just beautiful Dawn! We must like the same things! I bought a Jelly Roll of the same fabric and have made a (yet to be finished) quilt from it at a class I went to in Gawler last year. I must say though, I like yours SO much better than mine! You a really talented Dawn, and it is great to see that you are getting your designs published in a well known magazine like Homespun. Well done!! 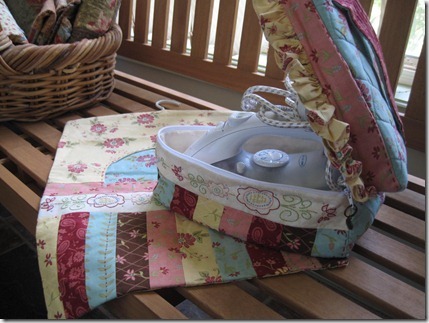 Congratulations on getting your quilt into Homespun - it's absolutely gorgeous. Can't wait til the mag arrive! What a gorgeous quilt! You should be so proud! The quilt looks great in the piccie but iam lucky to have seen it in the flesh and it looks sooooooooooo much better. Congrats on being published again. Your quilt is sooo gorgeous! Will definitely be getting this months issue! Gorgeous!! Love this quilt, I'll be looking out for my copy! !